Summertime has arrived in East Texas. The cool evenings and enjoyable 80 degree days of late spring have begun to yield to the uncomfortably warm southerly winds ushering in what I like to call Texas convection cooking, where we are all slowly cooked by the wind. Summertime brings to mind many wonderful memories of family vacations. I distinctly remember trips to Estes Park, Colorado and Gatlinburg, Tennessee. As a kid I was less concerned about the Texas heat, but the mountains were a nice escape from it for a while. It was fun to learn about the history of other states and see their famous attractions like Lookout Mountain and Pikes Peak. While our family was off making memories, in my childhood innocence, I did not think about the cost of the vacation or how the utility bills would be paid while we were gone. We were fortunate, and my parents planned ahead to make sure bills were paid, the mail was held and my Dad could take time off from work. Nonprofit organizations can’t afford to take time off. The services they provide are needed year round. Each week, area food pantries must be open to make sure families are fed. Individuals in need of medical or dental assistance need Bethesda Health Clinic to be open normal business hours throughout the hazy days of summer. This same scenario plays out all over East Texas as families in need seek out the services and resources provided by area nonprofits. 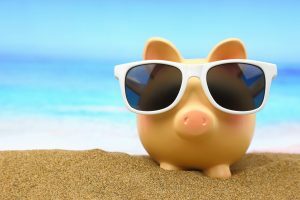 During the summer, generous donors go on vacation which can cause a slump in contributions and affect the ability of local nonprofits to meet their monthly expenses. In addition, the summer heat causes an increase in need for utility assistance for many families as electric bills rise to keep families cool. Donors and charities would do well to plan ahead for the summer slump in contributions. The summer slump has been a formidable opponent for churches for years. Many factors play a part in this, including lower weekend attendance, vacations and summer distractions. A study by Fellowship One found that contributions to the church in June, July and August of 2013 were down 13 percent in comparison to the previous three months. Another study by Vanco found that offerings to the church in the form of a check were down 40 percent during the summer months when compared to April and December giving. Two simple ways to plan ahead for prolonged absences from giving are by establishing automatic payments or by using mobile friendly giving options. It is easy for a donor to get caught up in the activities of daily life, but by arranging recurring donations or automatic drafts one can simply set-it-and-forget-it. Another way to plan for giving during your busy summer is through social media. Encourage your favorite organization to make sure they can accept gifts via social media. While visiting National Parks or water parks this summer, we are still connected to the people and organizations we love through social media. In 2015, Facebook introduced a donate button for charities. The donate button allows users to contribute to a charity through Facebook instead of having to navigate to an external donation site. Of course, once the user donates, he or she can share the cause that they supported and that post will feature a donate button as well. Giving on the go is not just a hobby of the millennials. According to a study by The Dunham Company, 67percent of donors age 40-59 said they made a donation online in 2015. These options are both beneficial to the donor as well as the organization because the donor can have flexibility in their schedule and the organization that they love will have a consistent revenue stream throughout the year. Finally, summer vacation is a great time for families to introduce the concept of “giving back” to children who are out of school on summer break. Spending time helping an organization makes teens more aware of the community’s needs and the various ways they are able to help. This sense of service will follow them into adulthood, and over time will make a huge impact on the prosperity and success of their own neighborhoods. When considering where to volunteer, help your teen identify interests, such as caring for kids, helping to create a better environment, working with seniors, rescuing animals or supporting the arts. It takes more than just financial support from donors to achieve a nonprofit’s mission. Utilizing volunteers from all ages and backgrounds can help a charity reduce their operating costs. As you and your family make your summer plans, looking for summer service opportunities, making arrangements to make sure your contributions continue while you are gone or giving on the go may be your next best opportunity to give well.